The GAC Runners will once again convene on Woodward Park in Fresno, California for their annual participation in the Turkey Trot. We invite all Central California GAC families (and those that may be in the area for Thanksgiving celebrations) to join us for the 5K run or 2 mile walk. The run and walk both benefit the Community Food Bank. If seeing your GAC family isn’t enough motivation to come out to the Turkey Trot, all registered participants get a free T-shirt and a personal pie. There’s also a costume contest, so let us know if you’re coming so that we can make sure you can join our Thanksgiving themed group costume! The run and walk begin at 8 AM on Thursday, November 22nd. We hope to see you there! 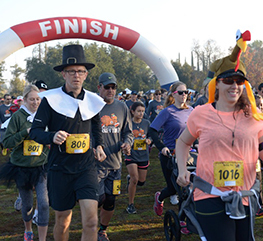 Click here to register for the Fresno Turkey Trot. What are the GAC Runners? Click here to find out more about GAC Runners.